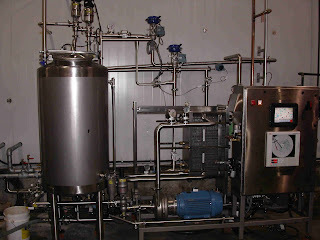 The internet source for discussion and knowledge on pasteurization equipment, technology, and equipment selection for flash pasteurization, tunnel pasteurization, and used pasteurizers. Have a topic you'd like to see addressed or an article you'd like to post? We have all heard that flash pasteurization treats the product but not the package. Flash pasteurization is not always what it's sold to be, and in many cases only half the facts are considered. Both scenarios have effects which need to be considered. In scenario #1 when a product is recirculated through the flash pasteurizer during a stoppage, the amount of product being recirculated (generally 50 liters depending on the size of the flash unit, recirculation pipe etc) is treated and retreated over and over. This product is then generally dispatched downstream to packaging. Even if the product is then mixed in a buffer tank where it is diluted, it is still a relatively large amount of product. This takes away from the argument that flash pasteurization lessens flavor impact. In the event that the product is chased out with water, there is product which is sent to drain each time the flash unit starts and stops. Like many situations, the overall efficiency of the downstream operation then becomes a key factor in the justificaiton of the equipment, and this product waste needs to be considered. Particularly in the case of small packaging operations the product waste can accumulate over time and product waste is generally an unforecasted cost of flash pasteurization. This is where the "turn down" ratio of a flash unit becomes important. This feature allows the flash unit to run slower as the downstream buffer tank fills and is available only with variable speed units which come with other controls challenges to ensure that all product is proprerly pasteurized. Reference other articles in this blog relative to energy impacts and other unforeseen costs associated with flash pasteurization. you need to know your equipment..experience only...that risk is alway going to be there,all you can do is mini your total lost..